1970mm High. 1068mm aperture. 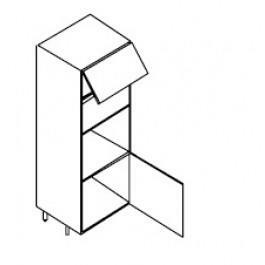 Requires 1 door 285mm x 596mm top hung, 1 door 570mm x 596mm and 1 infill 115mm x 596mm, Central appliance shelf supplied loose. 2150mm High. 1075mm aperture. Requires 1 bottom door 570mm x 596mm and 1 top door 495mm x 596mm with 2 adjustable shelves and I supplied loose. Includes PVC edging, BLUM Clip on Hinges and adjustable feet. Cabinets can be colour co-ordinated at no extra cost.